WALL STREET RAW HAS LEFT THE AIR WITH ITS FINAL BROADCAST APRIL 13, 2019. 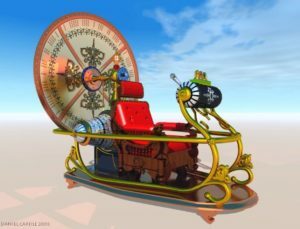 JUMP ON BOARD MARK'S FINANCIAL, POLITICAL, SPIRITUAL AND MUSICAL TIME MACHINE! Wall Street Raw! is hosted by Mark Leibovit, former 'Elf' on the decades running Wall Street Week with Louis Rukeyser PBS television program and former 'Market Monitor' guest for 30 years along with Paul Kangas on the PBS' The Nightly Business Report. Mark shifts through the noise in the financial media and applies technical analysis, contrary thinking and cyclical analysis to discern trends and money-making opportunities in all the major markets. FOR ADVERTISNG AND SPONSORSHIP RATES ALONG WITH INTERVIEW INQUIRIES, PLEASE CONTACT MARK AT MARK.VRTRADER.COM OR LEAVE A VOICEMAIL MESSAGE AT 602-284-6384. WALL STREET RAW OFFERS 30 SECOND, 60 SECOND SPOTS & 6-7 MINUTE INTERVIEWS DURING THE ONE-HOUR PROGRAM. Mark Leibovit, CIMA, AIF, is Chief Market Strategist for VRTrader.com. His technical expertise is in overall market timing and stock selection based upon his proprietary VOLUME REVERSAL (tm) methodology and Annual Forecast Model. Mr.Leibovit's extensive media television profile includes seven years as a consultant 'Elf' on "Louis Rukeyser's Wall Street Week" television program, and over thirty years as a Market Monitor guest for PBS "The Nightly Business Report". He also has appeared on Fox Business News, CNBC, BNN (Canada), and Bloomberg, and has been interviewed in Barrons, Business Week, Forbes and The Wall Street Journal. Mark Leibovit was ranked Timer Digest's #2 Gold Market timer for 2011, and has also been named the #1 Gold Market timer for the 5 year period ending in 2010, and the #1 U.S. Market Timer for 2006 and the #1 Intermediate U.S. Market Timer for the ten year period December, 1997 to 2007. He was a 'Market Maker' on the Chicago Board Options Exchange and the Midwest Options Exchange and then went on to serve as Director of Research at Freehling & Co. and later Director of Technical Research at Rodman and Renshaw (both in Chicago). Mr. Leibovit now publishes a series of newsletters at www.LeibovitVRNewsletters.com and hosts his own weekly national radio talk show - Wall Street Raw through the GCNlive.com network along with affiliated radio stations. He is both a Certified Investment Management Analyst (CIMA) and Accredited Investment Fiduciary (AIF), and is also a member of the Market Technicians Association and CFA Institute. Mr.Leibovit's specialty is Volume Analysis and his proprietary Leibovit Volume Reversal Indicator is well known for forecasting accurate signals of trend direction and reversals in the equity, metals and futures markets. He has historical experience recognizing, bull and bear markets and signaling alerts prior to market crashes. His indicator is currently available on the Metastock, eSignal and TradeStation platforms. His comprehensive study on Volume Analysis, The Trader's Book of Volume published by McGraw-Hill is a definitive guide to volume trading. It is now also published in Chinese. Mark has appeared in speaking engagements and seminars in the U.S. and Canada and provides customized Volume Analysis for managers and institutions. Provides investors, portfolio managers and traders his unique insights, opinions and recommendations on 'sin' or 'vice' equities which includes cannabis (marijuana), alcohol, weapons and defense, gaming, prostitution, sexual paraphernalia, entertainment, travel including cruises, luxury goods including jewelry, and luxury cars (e.g. a Tesla), fast food restaurants and even big pharma (drugs are a vice too!). What Will The Stock Market, Gold, Palladium, U.S. Dollar, Treasury Bonds, Crude Oil, And Natural Gas Do In 2015? If you knew the answer to that question, how would your investment or trading results be different? VR Silver uses the Volume Reversal (tm) system developed by nationally recognized market technician and former Wall Street Elf with Louis Rukeyser, Mark Leibovit. High Performance Traders are always looking for that next tool to give them an edge. At Mark Leibovit's VRTrader.com, we believe that VR Platinum is that tool.